Greg runs 9.94@143mph. Greg's R35 is more of a road race/street car than a drag car. R888 20 inch tires, Swift Springs, STILLEN Sway bars. The engine sports a pair of Greddy TD06 turbos. At 770 whp the car is no slouch, one of the fastest on the west coast. One of the fastest in California. In the morning he tried a set of 18" drag radials, but he didn't like the wheel hop, so he swapped over to the R888. 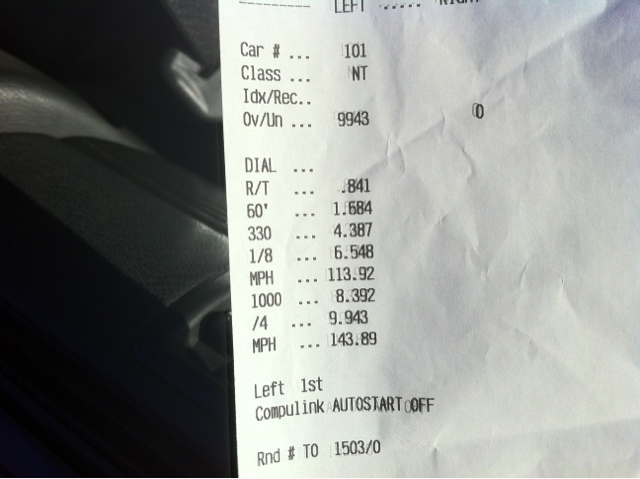 On the 9.94 pass, he got just the right amount of wheelspin with LC1, no bog, and the car just took off with a 1.68 60 foot. Its all about the 60 foot, and just that improvement dropped him from low 10's into the 9's. Videos coming soon. Rif brought out his 2012 Black Edition GT-R that also spends a lot more time on the street and road course than the drag strip. His goal was to get into the 10's, but it just wasn't going to happen today. His best passes were in the 11.2 @ 124 mph range. He has the SpecV exhaust tips, but otherwise the exhaust is all stock. Next he is eyeing an exhaust for some more power. Check out the videos of both GT-R's after the break. Rif's 2012 Black Edition Nissan GT-R. Brilliant post! Thanks for sharing those images. Keep it up!